These are great games for most families. They have fairly simple rules, but have enough decision-making to remain fun for both kids and adults. Forbidden Island – A cooperative game by the same designer as the popular Pandemic game (recommended in past gift guides). Forbidden Island manages to simplify Pandemic but still capture the fun of a cooperative game (everyone wins or loses together) where each player has a small special ability and must move about the game board to try to accomplish an overall goal. In Forbidden Island, players move about a grid of tiles that slowly sink into the sea (and are removed) while simultaneously trying to gather up four artifacts before making their escape from the island. Players much cooperate to prevent each other from standing on a tile that sinks or getting stranded on an isolated tile. The difficulty of the game can be adjusted slightly to accommodate beginner or advanced players making this a good selection for families that want a bit less direct player to player conflict in a boardgame. Mosaix – Almost a balance between an abstract and a dice game, in Mosaix players take turns rolling a set of four dice displaying circles, triangles, and X’s. The roller of the dice gets to arrange them in any orientation and then all players must include the formation of symbols onto their personal grid of paper that serves as their playing surface. As more symbols are rolled, players add the new formation to their paper in attempt to make multiple groups of similar symbols (such as five or more “touching” triangles). When one player’s grid is filled the game ends and players score points for the number of each type of symbol multiplied by the number of distinct groups of that symbol. A fun little game for those who enjoy drawing or spatial reasoning, it even plays well with little kids who simply enjoy their turn at rolling the dice and arranging them. 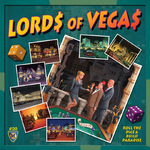 Lords of Vegas – If Monopoly-like wheeling and dealing are more for you, give Lords of Vegas a try. Players take on the role of developers in Vegas in an effort to gain the most money. Purchase a lot from a private, limited selection of locations and claim it by placing one of your dice within a casino marker on that square. Players gain money for partial ownership of casino groups throughout the game, but only gain points for control of those same groups. The player with the highest value die in a group is considered its owner. Players can convert their casinos between various types and even pay to force rerolls of all dice in a casino in a bid to gain control. About the same complexity of Monopoly (with fewer special rules or exceptions), Lords of Vegas makes for a good family game for those looking for a financial type game with a bit of aggressive player interaction. 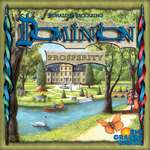 Dominion: Prosperity – I’ve included the strategy card game Dominion on my list for two years running, it even won the German Game of the Year. In Dominion, players take turns using a private deck of cards to obtain new cards from the middle of the table. In this way, players slowly build up a more powerful deck of cards until they start purchasing special victory point cards which get in the way of their other cards but award points at the end of the game. The game comes with 25 different types of cards to play with, and only 10 are used in each game. However, that variety hasn’t stopped many expansions from being released. My current favorite expansion is Prosperity. It basically takes the game and makes everything bigger – cards that cost more to obtain but provide bigger abilities. Whereas the largest coin, Gold, used to be worth 3, there is a Platinum card worth 5. The largest point card is now Colony worth 10 points vs the previous most valuable 6 point Province card. Best of all, the expansion manages to kick overall scores up a notch without significantly increasing the time it takes to play a single game (typically 20-30 minutes). I highly recommend Dominion, and Prosperity continues to add more life to the game. Due to shipping problems it can be a little hard to find right now, but many online stores still have it in stock. 7 Wonders – Hailed by some as “The New Dominion”, 7 Wonders is a 3 to 7 player game of simultaneous card drafting and economic building. Players start with a hand of 7 cards, play one and pass the rest to their left. Everyone then chooses one of their (now 6) cards, plays one and passes on the leftover five. This continues six times with the last, rejected, card tossed away. One round of 7 cards is considered a single age and the entire game lasts for three ages. To play a card, a player must have (or purchase from a neighbor) the appropriate resources displayed on the card. Some later cards can even be played for “free” if you have played a specific previous card. Thus, choosing cards is a mix of selecting cards that will give you ongoing resources (to get future cards) and cards that give points. Points can be obtained in many different ways. Players get points at the end of each age for having a larger military than their neighbors, or points at the end of the game for having specific cards or groups of cards. While beginners can feel the game is a bit out of their control at first, as players get more familiar with the cards that can appear more longer-term plans can be attempted. This is a particularly great gem since it can be played in only 20-30 minutes and the simultaneous play keeps it within that time limit even with the maximum of seven players. 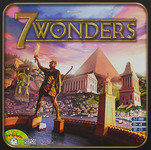 7 Wonders has proven so popular, it may be difficult to find. 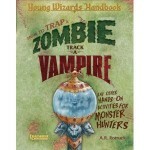 However, it should be easily available later in 2011 when a second print run comes out. Shiver-Stone Castle – I’ve looked through a number of kids titles this year and so far, the only one that has really hit it off with me and my 4 year old is Shiver-Stone Castle by the German game company HABA (all their games come in bright yellow boxes). This game has two decks of cards. One consists of a set of individual cartoon characters such as a spider, teddy bear, knight, or a bat; the other deck contains a small scene with some of the characters spread around (some are even partially hiding behind others.) One player reveals the scene card for a short period of time, and then flips it back face-down. Players then take turns choosing from the character cards, picking any character they remember being displayed on the briefly viewed scene. Once everyone has chosen all the characters they wish, the scene is flipped back over and scored. Players gain one point for correct selections and lose a point for each incorrectly chosen character. Games are played to a selected point total that is tracked using cute little wooden ghost markers and the backs of some of the scene cards. This small little game easily fits into a purse (or large pocket) and provides a nice twist on memory games for a wide age range. I even play it with my son and simply ignore most of the scoring. Rory’s Story Cubes – For something that truly fits in a pocket and makes for a nice diversion while waiting at a table in a restaurant, look no further than Rory’s Story Cubes by Gamewright. This is nothing more than a small box containing nine dice displaying 54 different symbols like a wand, rainbow, fish, keyhole, or building. Players roll the dice and then make up stories containing the pictures displayed. One player can tell the entire story or the dice can be divided up and each player has to bring the pictures they roll into the story. There isn’t any game here, but the idea works great to get kids’ (and adults’) imaginations running and occupy some downtime. Small enough for a stocking stuffer, this is a great creative tool for anyone hoping to foster some more imaginative play. OK, OK, I’m breaking rules by listing a few electronic devices but here are a couple of toys that just caught my eye this year. 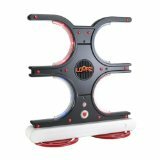 Loopz – Remember the old Simon Says electronic toy? This takes that basic idea and kicks it up a notch. Loopz consists of a weighted tower with two openings branching off each side. Players place their hands within an opening to activate a sensor. Several game modes include a memory game where a pattern is slowly built up until you make a mistake, or a musical game of reaction time where the player must place their hands within the appropriate opening (signified by a small LED lighting up) as the music plays. A final mode turns the game into a strange sort of musical beat-box that can be used to make rhythms and songs. Made by Mattel, the game should be available in most big stores and provides some fun active entertainment for kids about 8 and up. The only caveat is the game’s base, which can get knocked over during accidental contact during frantic play. This can be fixed by bracing it slightly or taking turns holding it down during fast play. 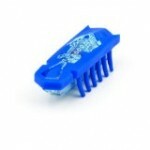 Hex Bug Nano – I wandered past these in Radio Shack and had to stop to check them out. They’re little tiny robotic creatures that look like a cockroach crossed with a computer chip that escaped its socket. Turn them on and they vibrate extremely quickly such that their bent legs propel them forward at moderately high speed. There really isn’t a game here, but you can buy little trays or streets for them on which to roam. Of course, a clear floor and a few books would also do the trick. The surprising speed of the little bugs is what really makes watching them fun. They’re only a few bucks, so yet another stocking stuffer option that could, in a pinch, serve as something to freak out your pet. Young kids run around playing “shooty-guns” and some of them bring that enthusiasm for things military into their older years. If there are any young or old military fans in your giving circles, here are two boardgames that don’t require long hours to learn or to play. Battle Cry: 150th Anniversary Edition – Around 2000, the original Battle Cry appeared on the scene and made big waves as a very approachable and fast-playing wargame of the civil war. In later years, a similar system was applied to World War II (Memior ’44) and fantasy battles (BattleLore) and many expansions were released for both. Hasbro/Wizards of the Coast has rereleased the Battle Cry game this year and it is an excellent choice for anyone who is interested in a simple, quick playing wargame OR is simply interested in the Civil War. Players move small groups of pieces on a hexagonal map using a hand of cards to “activate” specific units. The fog of war is simulated since you can only use the actions and abilities presented by your cards. Terrain effects can come into play through tiles placed onto the game board, while unit attrition is handled by removing pieces from unit grouping. Take out all the pieces in a unit and you get to keep the last piece as a trophy representing a victory point. With rules for retreats, assaults, generals, terrain effects, and various card effects the Battle Cry system is surprisingly versatile while remaining playable by non-gamers or even a young teen or tween. Role Playing Games have surged in popularity in the past couple of years. If someone in your life shows a leaning towards imagination, creativity, or storytelling, an introduction to the world of role playing games might be in order. DC Adventures – Brand-name superhero roleplaying games come and go quickly, but just this fall saw a release of a new DC themed superhero role playing game, DC Adventures by Green Ronin Press. Players create their own superhero by spending points to increase and add to their abilities. Combat and other conflicts are resolved by rolling a standard 20 sided die. This past fall saw the release of DC Adventures Hero’s Handbook (in PDF and book form) containing all the rules needed to create characters and play. As with most superhero RPGs, creating a character is the most complex part of the process. Once a player has a character, the game plays fairly smoothly and could be played by a young teen or tween. Dungeons and Dragons – This fall, leading into next year, the folks at Wizards of the Coast have focused on trying to make D&D even more accessible to new players through a line of products entitled “D&D Essentials”. Starting with the D&D Starter Set (similar to the old-school “Red Box” of D&D of yesteryear), players get everything they need to play the game for the first few levels of play including rules, cardboard tokens, maps, and an adventure or two. At a low price point, this is a great gift for potential new gamers. Gamers who know they want to dive into D&D or have already sampled the Starter Kit and want more can start out with other titles in the Essentials line. Players will want access to either or both of the Heroes of the Fallen Lands or Heroes of the Forgotten Kingdoms which contain rules for creating characters of any level. Someone needs to play the Dungeon Master and thus will need to get the Dungeon Master’s Kit (filled with adventure designing advice, maps, a couple of adventures, and monster tokens) and probably the Monster Vault as well (containing an adventure, maps, and LOTS of monster tokens with rules to go with them.) The new classes in the Essentials lines are specially streamlined to make playing them even easier for new players. They hold their own when compared to previous character classes, but are designed to be simpler so that beginning players aren’t overwhelmed with too many choices and details while playing. D&D fans who have been playing for the past few years will find useful new material in the Heroes books and the new monsters in the Monster Vault, but one of the best new items for experienced players is the new Rules Compendium which is a nice softcover book containing all the newest core rules in a single, well-indexed volume. Do you know someone suffering from Harry Potter withdrawal? Here are a few kid-friendly fantasy-themed books that might be worth a read. Wizards of the Coast have put out a few youth-oriented books, most notably Monster Slayers and Aldwyns Academy, both of which focus on unlikely adventurers in the form of younger kids who set off to take on magical problems much bigger than they first appear. 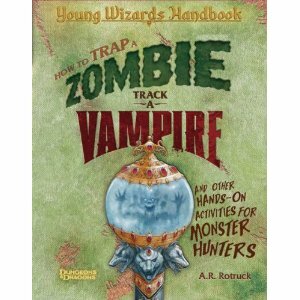 However, my current favorite release by Wizards is the book How to Trap a Zombie, Track a Vampire, and Other Hands-on Activities for Monster Hunters. This is a small hardcover activity book full of fun rainy-day ideas of things to do with kids. It includes such varied activities as how to preserve fruit for travel (recipes), how to build a scroll case (crafts), and how to play Blind Beholder’s Bluff (games). If you aren’t familiar with British author Terry Pratchett’s work, you should be. His books set in the fantasy themed Discworld universe are thick with humor and make great reading for young and old. His young adult line of stories about witch-in-training Tiffany Aching continues in this newest release, I Shall Wear Midnight. If you haven’t read any of the previous ones, start with The Wee Free Men, and go on from there. I hope you’ve enjoyed a short romp through the available non-videogame activities the have become available this past year. If you’re looking for even more options, be sure to check out Unplugged Holiday Guides from past years: (2003, 2004, 2005, 2006, 2007, 2008, and 2009). Alternatively, you can also check out the excellent book, 100 Hobby Games from Green Ronin Publishing. It contains essays on 100 of the best boardgames and RPGs from the past several decades, written by folks who live and breath these types of games. Now, it’s time for me to go wrap some presents and hopefully strike up a game or two with the ones that are already open. Have a great holiday season!